Cavitation is a natural phenomenon based on a low-frequency wave with a speedy vibration of fat cells at 40,000Hz which creates countless air bubbles in the liquid, which gradually grow, and implode a certain size. The energy in the form of heat (minor effect) and pressure wave (major effect) is released. 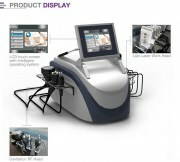 As the membranes of fat cells do not have the structural capacity to withstand the vibrations, the effect of cavitation easily breaks them, This acts on the cellulite and fat cell, to exhausts it out of the body by the lymphatic system. 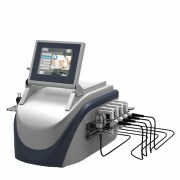 The cavitation treatment yields immediate and long-lasting results. Most of the clients experience 4 to 6 inches of circumference reduction after a single session, with increasing results after each visit. The results may vary with different tissue structure, treatment area, age, metabolism, medications, and changes in hormones. Proper diet and increased physical activity will certainly improve and help to maintain the results. Two RF heads, one is bipolar rf head for eyes, eliminate black circles, promote the ocular region blood circulation effectively, increase the product absorbing Tripolar rf head is for face, face line lifting, wrinkle removal, and promote blood circulation.